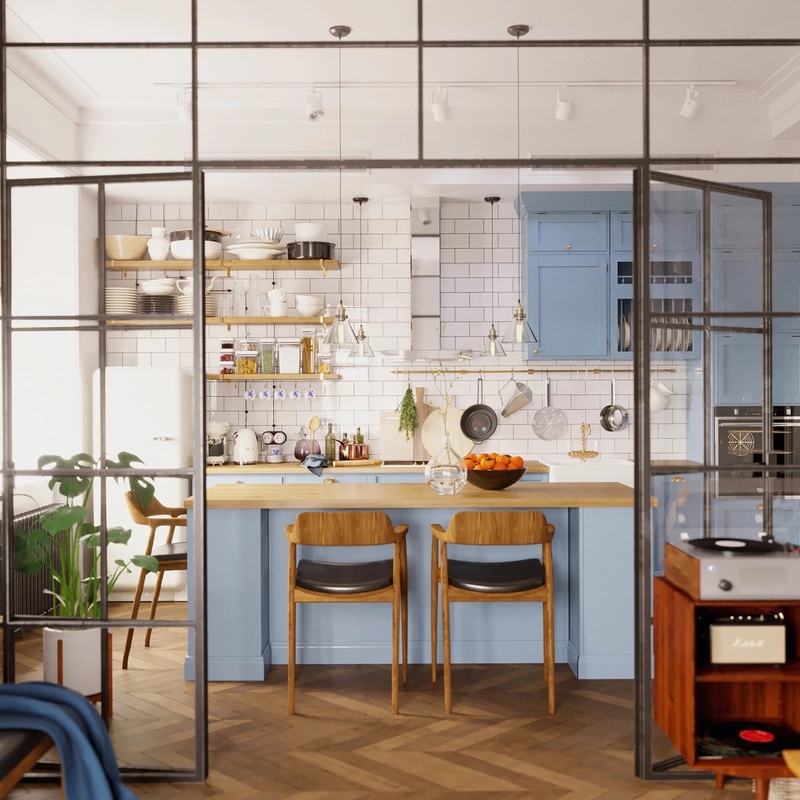 Set in a historic house in the centre of Novosibirsk, Russia, this 73.6 square metre apartment holds a distinctly Scandinavian style interior. Designed by Shubochkini Architects, the home has a comfortable down to earth vibe, where style and comfort are given equal billing. 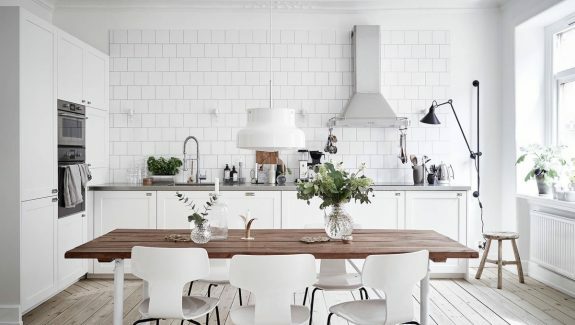 White walls are the main order of the day throughout this living space. 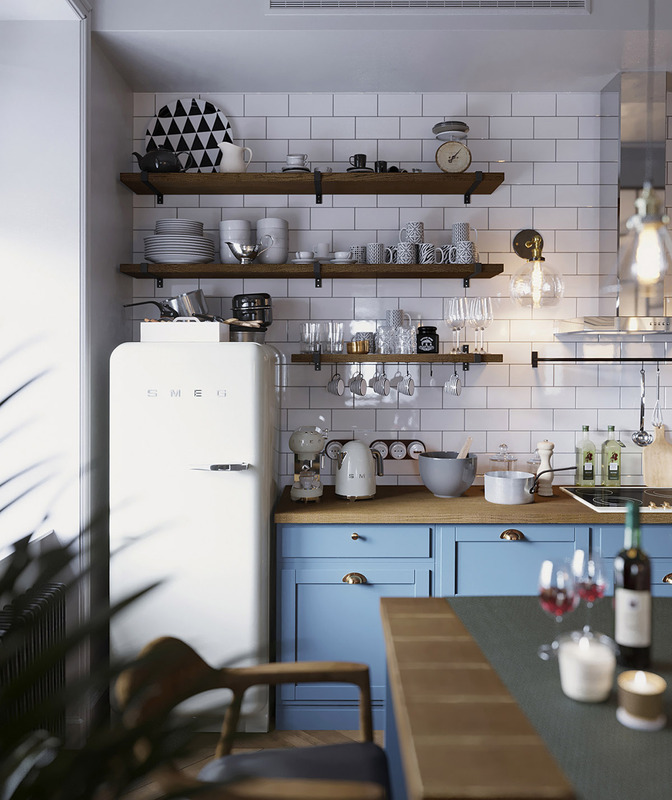 Colourful furnishings, art and textiles add eclectic flavour to the light scheme, along with a breezy blue kitchen. 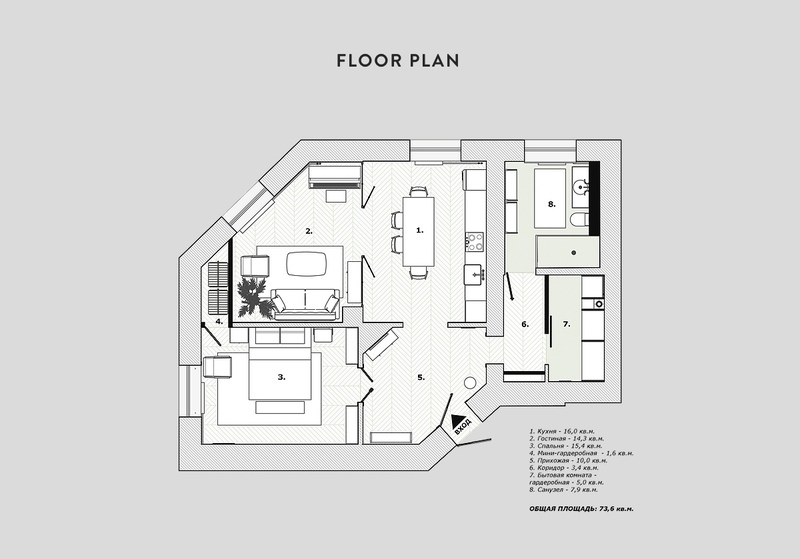 The generously sized kitchen diner and adjoining living room lead off a large faceted entryway, as does the homes only bedroom and an internal hallway that gives access to both the bathroom and utility. 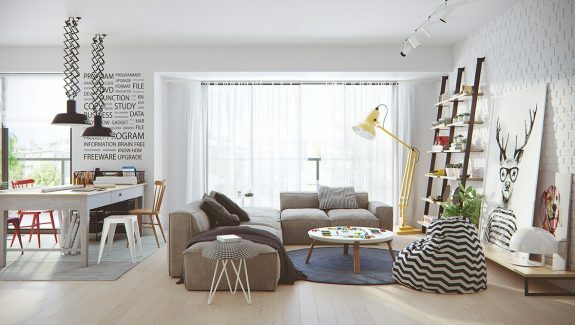 A camel coloured sofa adds visual warmth to the white living room decor. 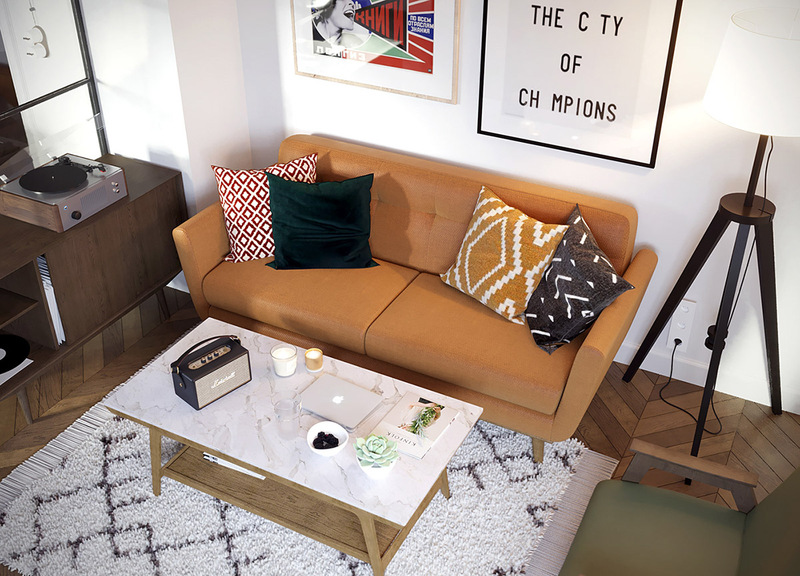 A collection of aztec pattern cushions in earthy tones tie in the wall art behind the sofa. 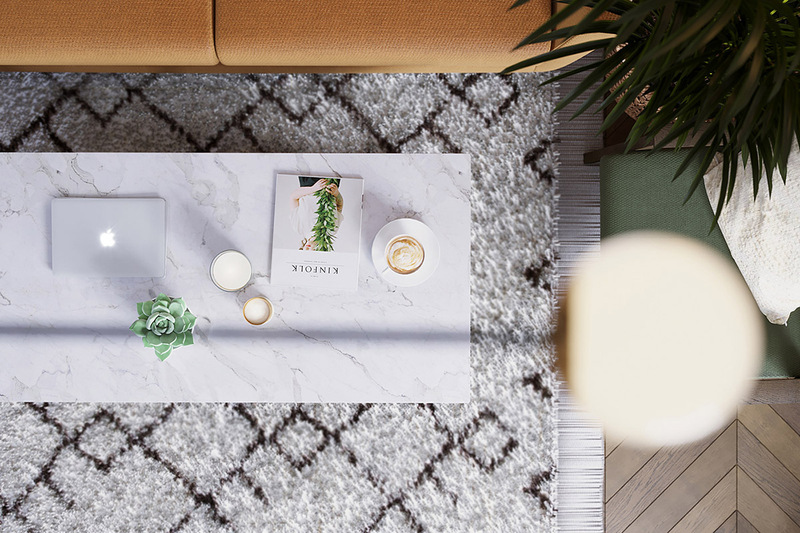 On the floor, an area rug matches the diamond print textiles. 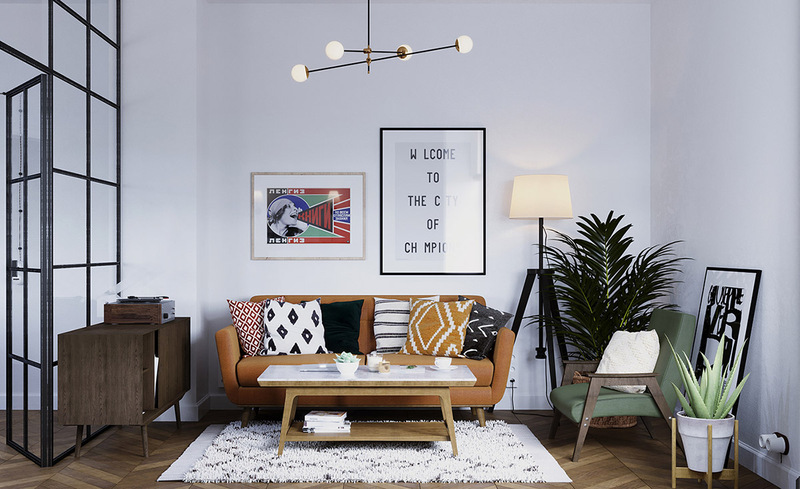 A modern chandelier is suspended in line with a Scandinavian style coffee table. 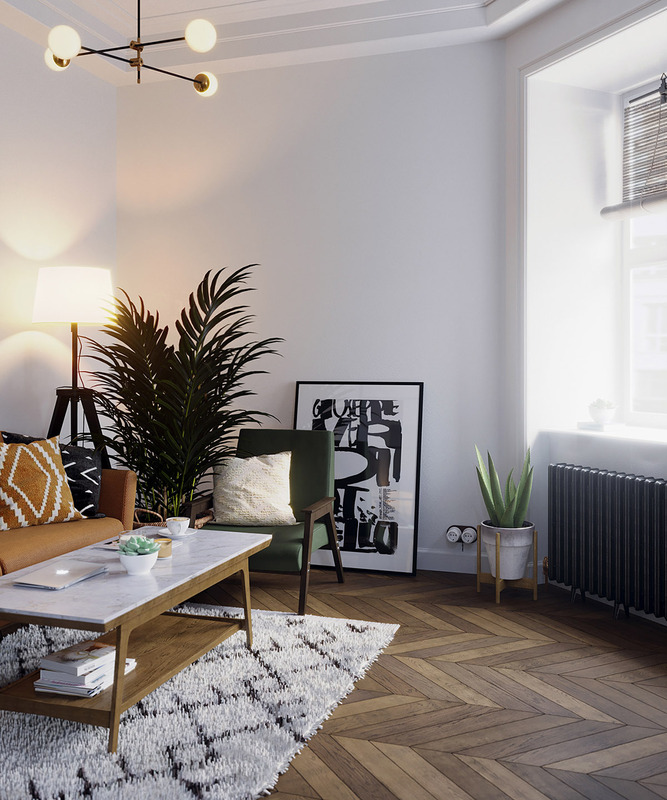 By the sofa, a tripod floor lamp is on hand to provide reading light. 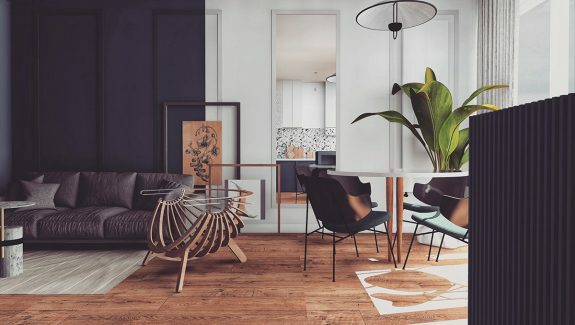 A green accent chair matches the colour of indoor plants that fill the space between furniture. The leafy accents bring life to the room and softly feather the edges. 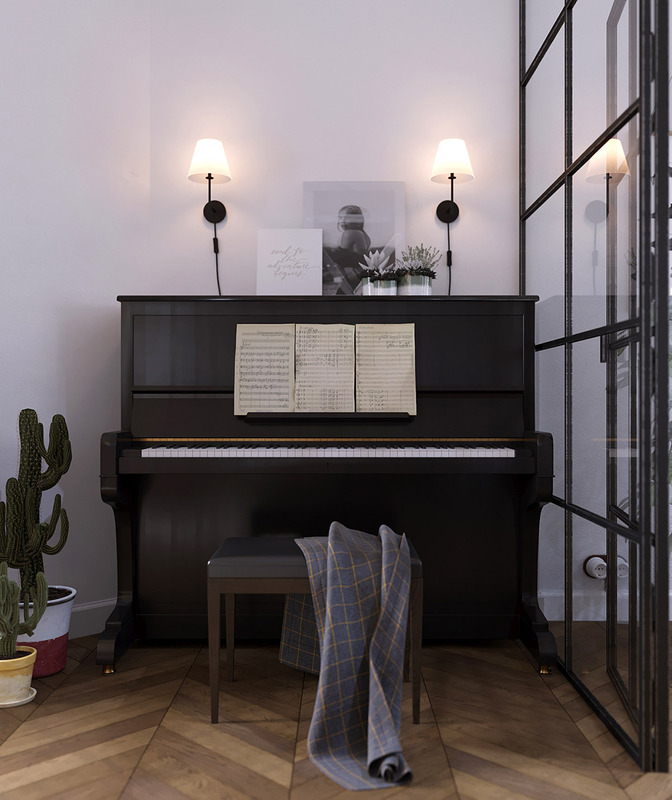 A couple of spikier potted pals inhabit the space next to an upright piano, which stands opposite the sofa. 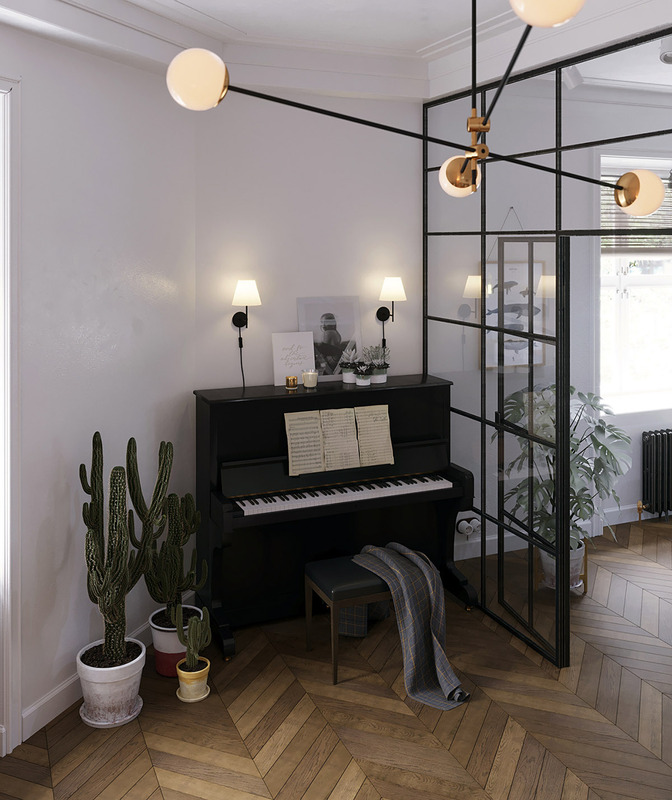 Two wall sconces light the music nook. 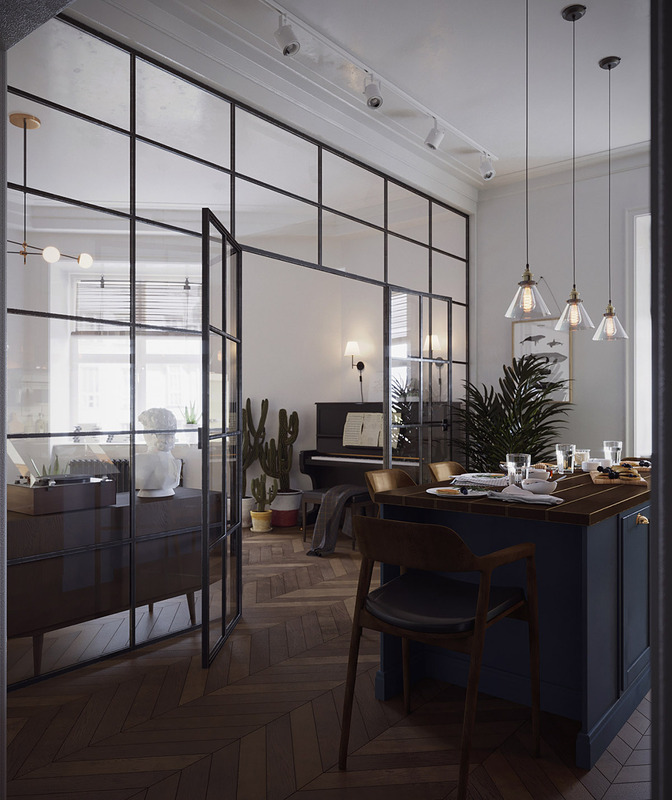 The living room is accessible only through a kitchen diner, which is separated from the lounge by an internal glazed wall and double glass doors. 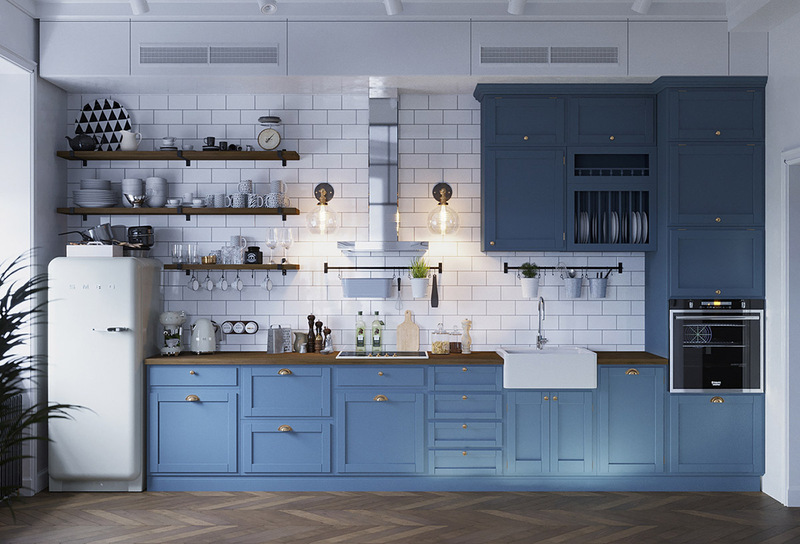 Breezy blue kitchen cabinets and a blue central island work gorgeously against a backdrop of white metro tiles. 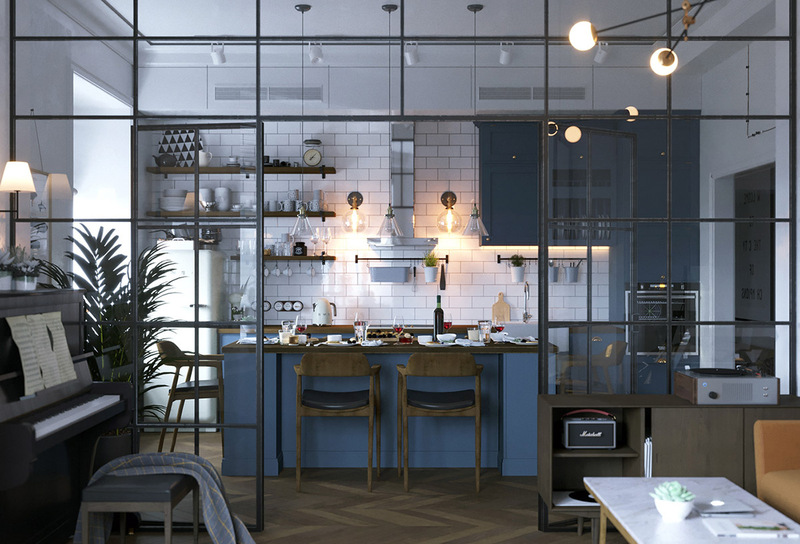 The interior glass wall and doors allow the compact lounge to be a part of the kitchen diner entertaining space or to be shut off from the noise and aromas of a working kitchen. Three glass dining pendant lights are suspended over the central kitchen island. 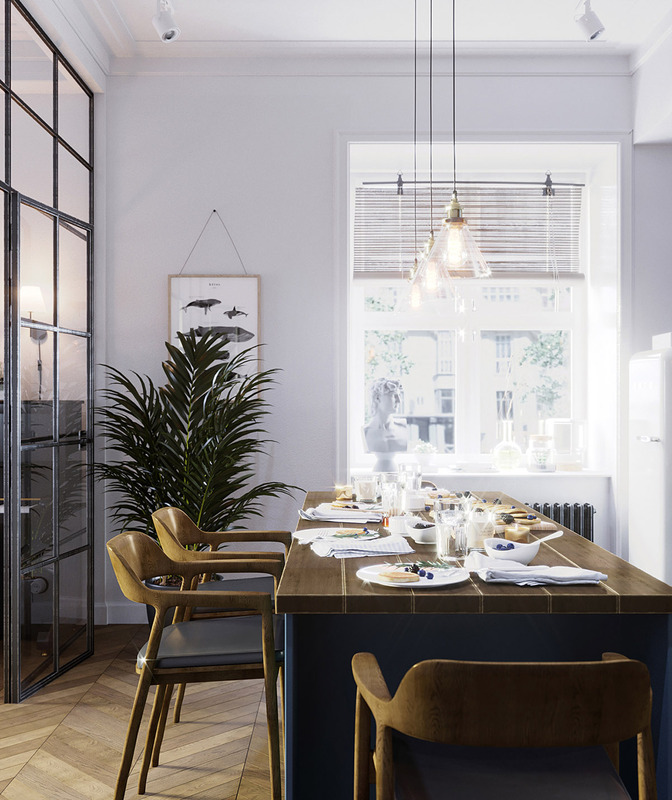 Five dining chairs surround the central kitchen unit to form a formal dining set. 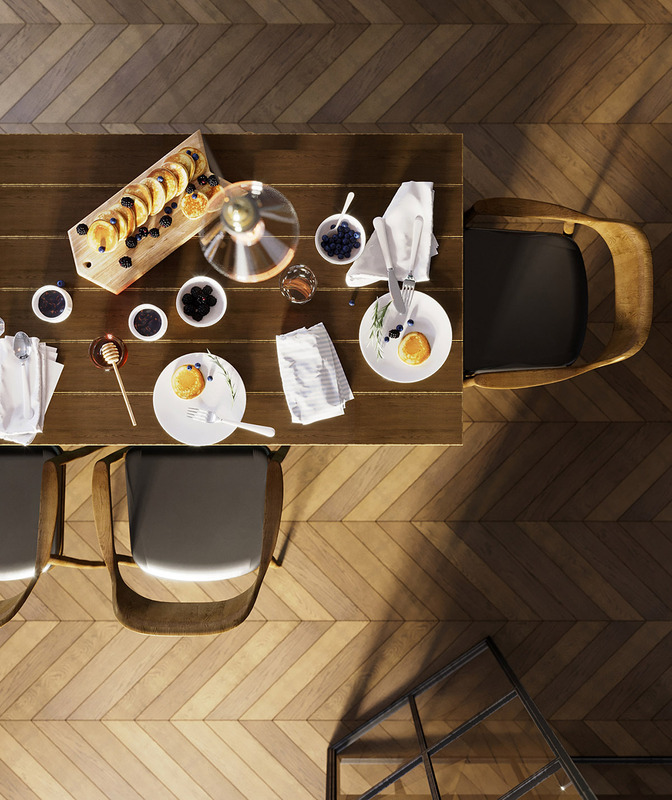 Leg room is created by recesses in the perimeter of the cabinetry. 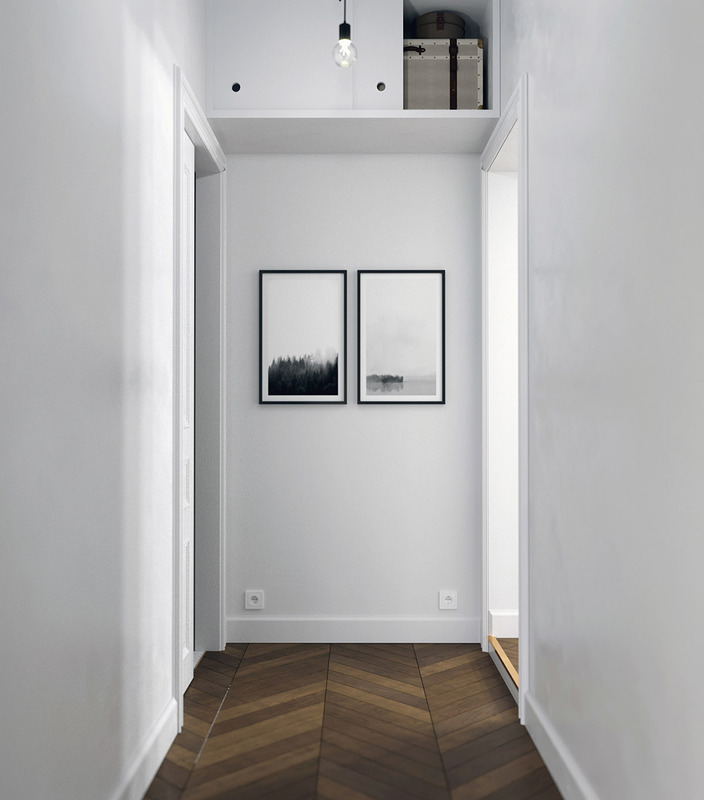 The herringbone floor is a warm wood tone that anchors the light and airy interior. Simple white flatware works well on a rustic wooden tabletop. Cupboard space below the dining island is spacious enough to store a menagerie of pots and pans. It also presents a handy place to store items for the table such as plates, pitchers and wine glasses. 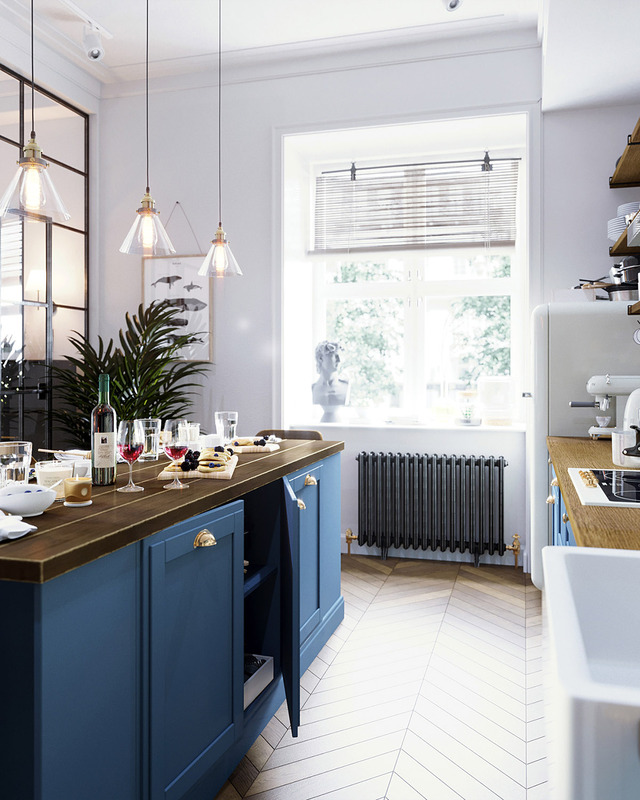 The wooden open kitchen shelving and matching worktops contrast with the blue kitchen. 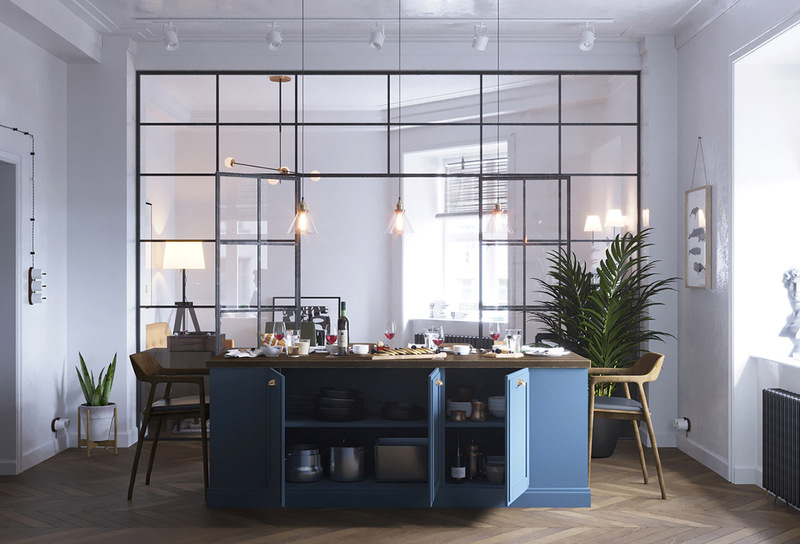 Modern crockery fills the shelves, making the exposed storage space part of the contemporary decor. 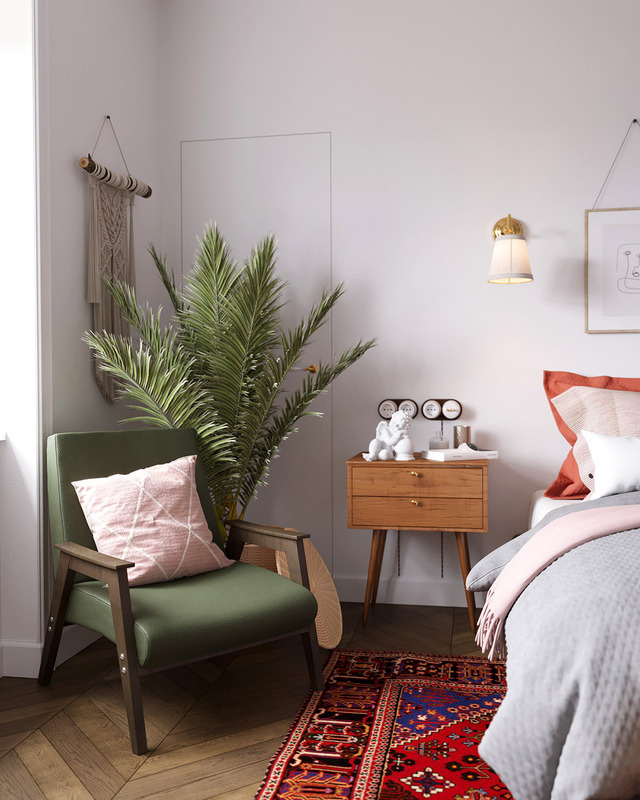 Earth tone accents add heat to a white bedroom scheme. 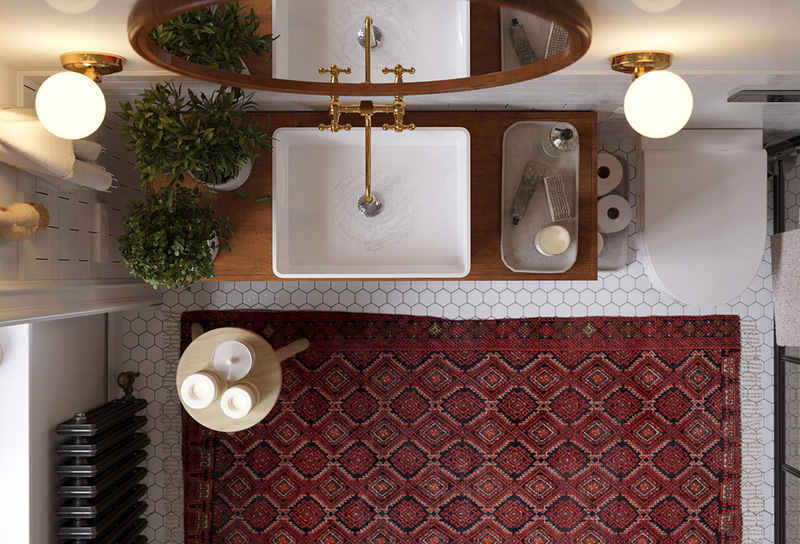 A traditional rug warms the floor underfoot, in shades of orange, red and cobalt blue. 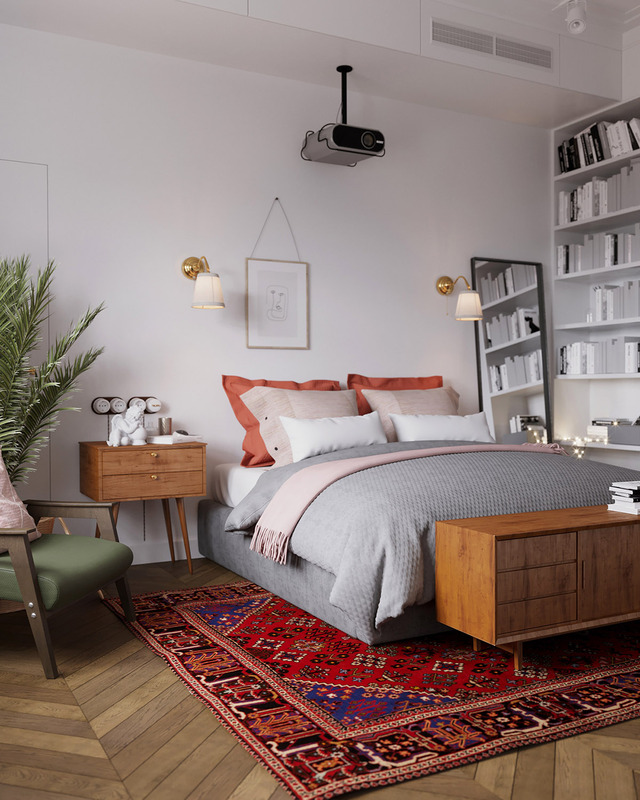 Two orange pillows link the rug colour to the bed, whilst the orange tone of wooden furniture pieces take it right around the room. A green bedroom chair matches the accent chair in the living room. It blends with the fronds of an established house plant filling the corner behind. 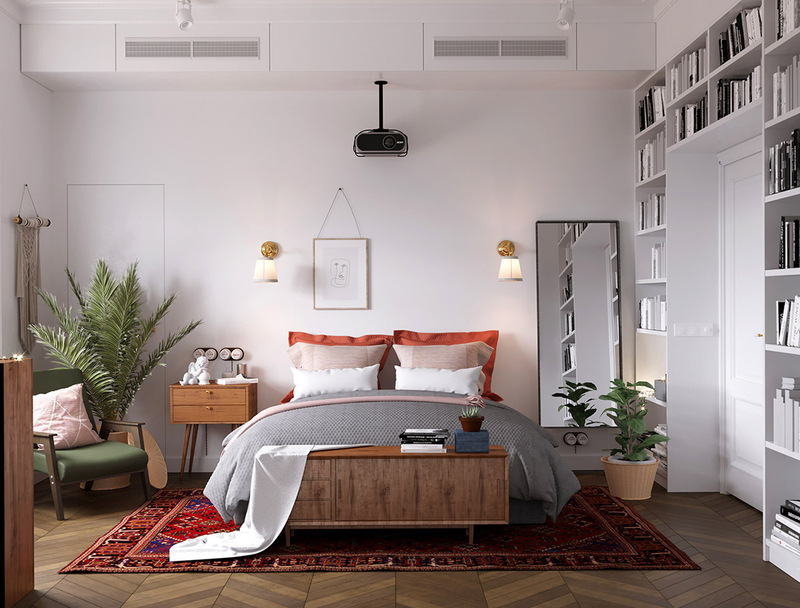 The bedrooms bookshelves are a bespoke design that climb each side of the bedroom door and connect across the top, making the most of vertical storage space. 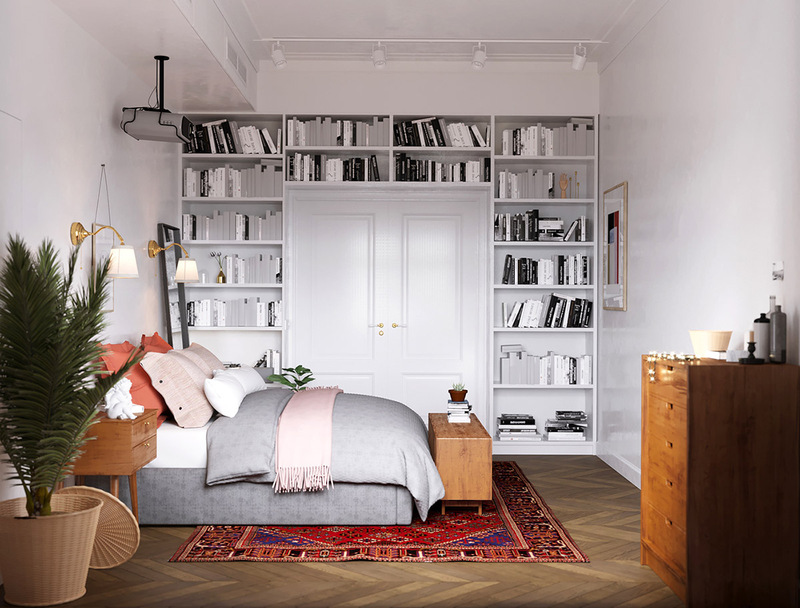 The towering shelves are filled with a home library sitting in wait for bedtime reading. However, a projector unit also waits poised to play a movie, utilising the smooth white wall opposite the bed. 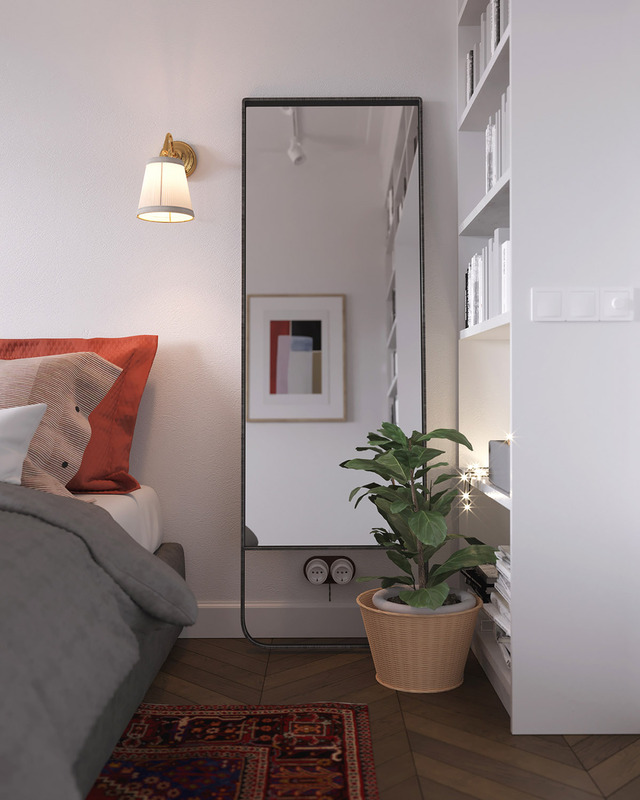 A black framed floor length mirror is propped by a wall sconce at the bedside. 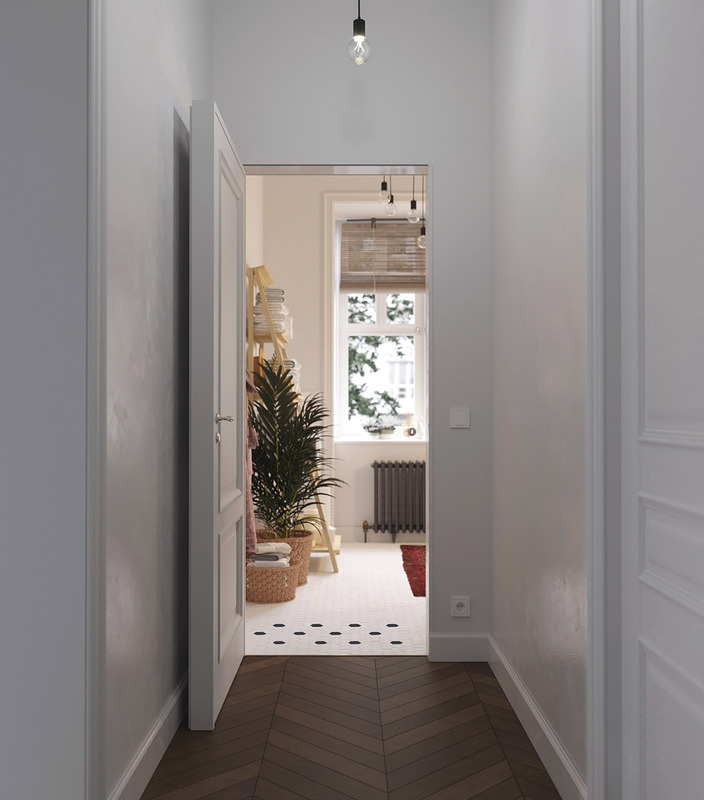 The hallway to the bathroom and utility room is white with a continuation of herringbone wood flooring. 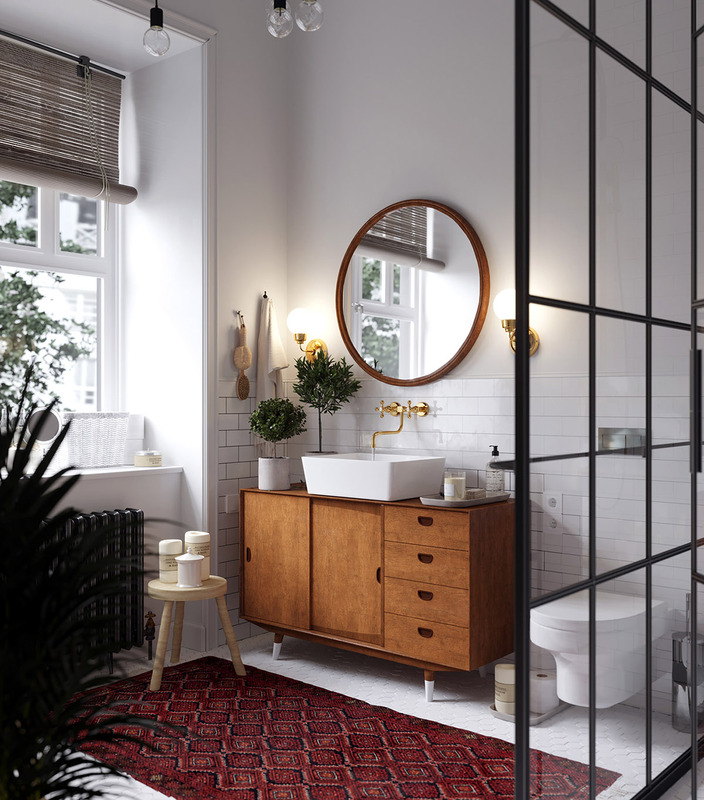 The bathroom has the same eclectic Scandinavian vibe found in the rest of the home. 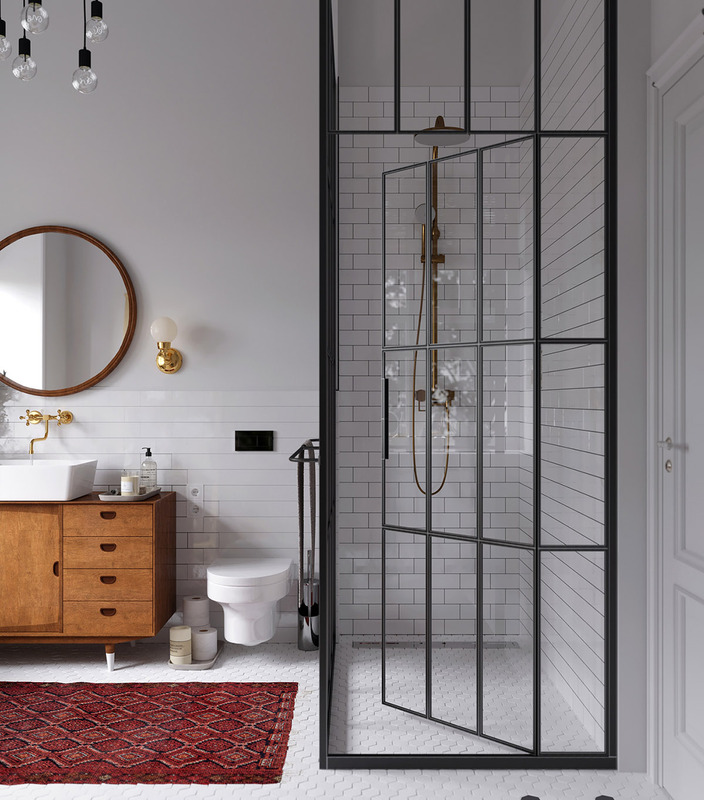 A red area rug warms the cold tile floor in front of a classic wood vanity unit. 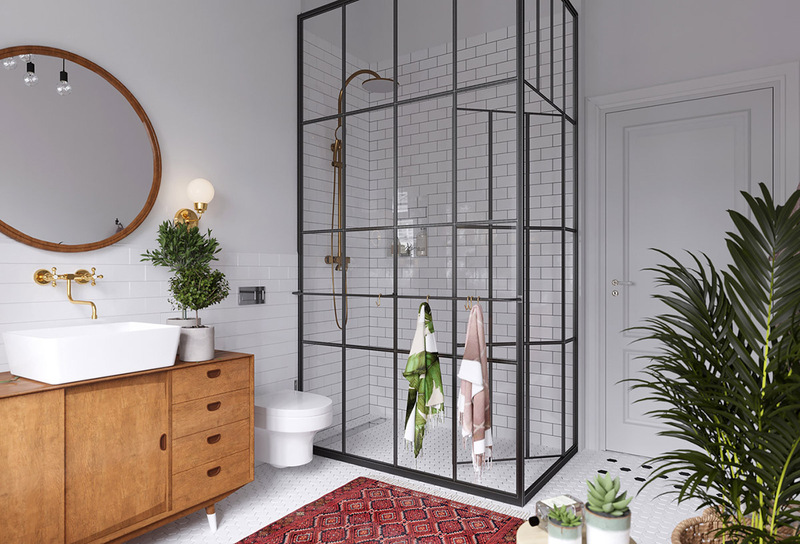 A black framed shower enclosure exactly matches the glass divide between the living room and kitchen diner. A unique faucet is wall mounted over a rectangular basin on the vanity. To match the gold faucet, a gold wall sconce is mounted at each side of the bathroom mirror. 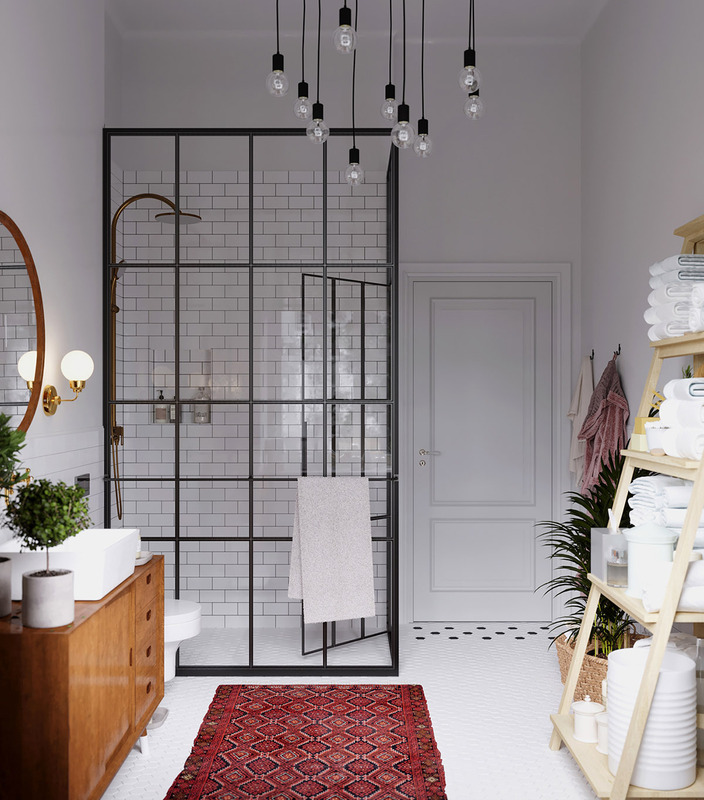 Utilitarian bulb pendants light the bathroom. 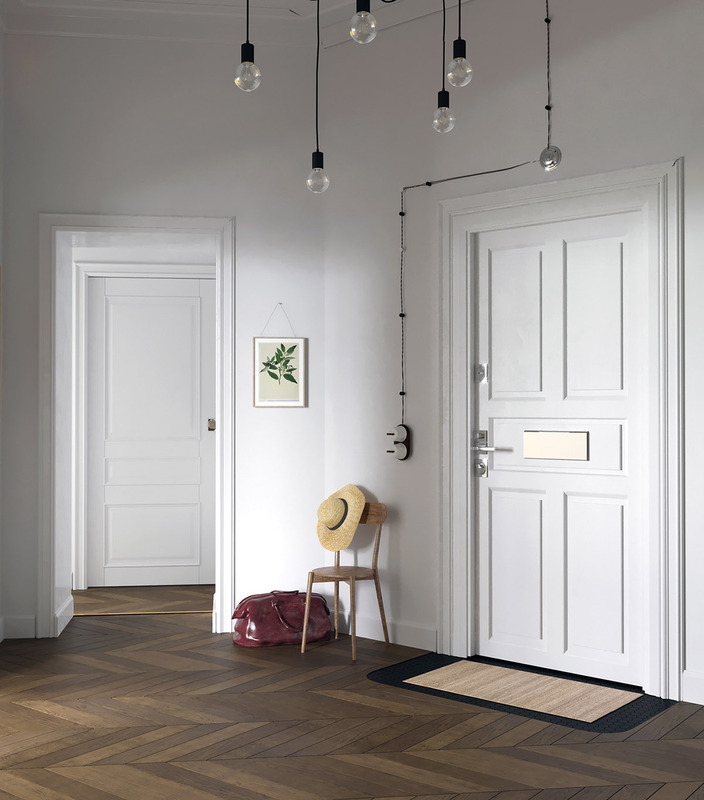 In this room, wooden flooring is replaced by geometric white tiles. 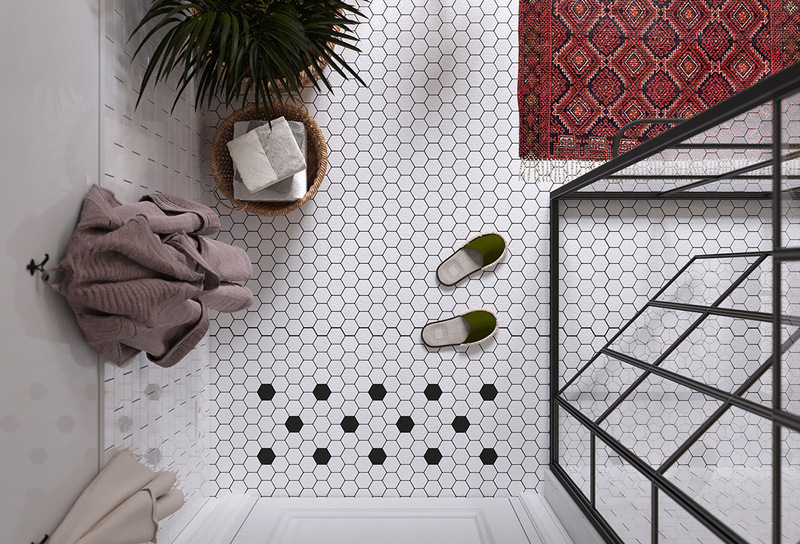 A pattern of black geo tiles have been set into the floor by the doorway. 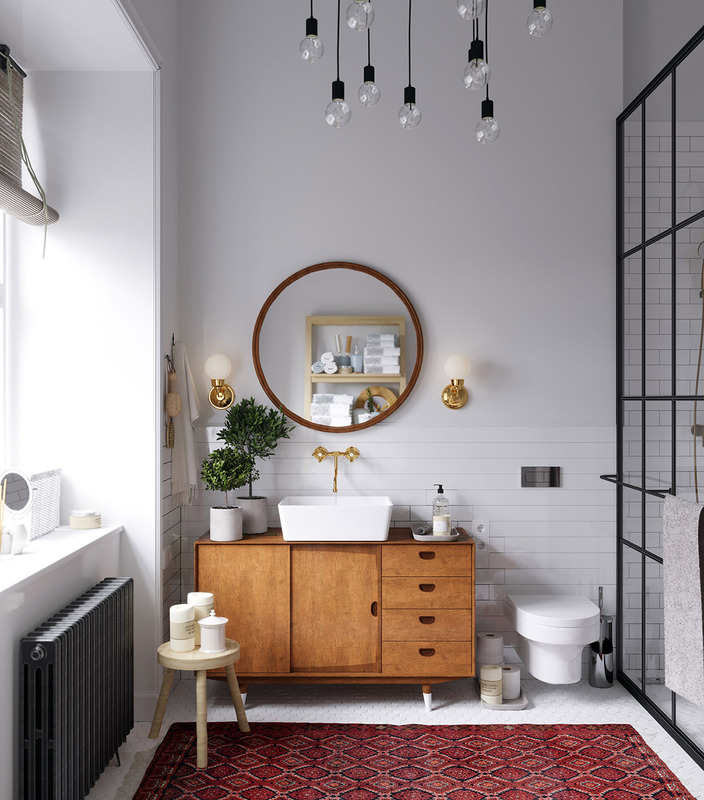 A couple of potted plants and a tray of toiletries sit to either side of the bathroom basin. A small wooden stool holds a group of scented candles. 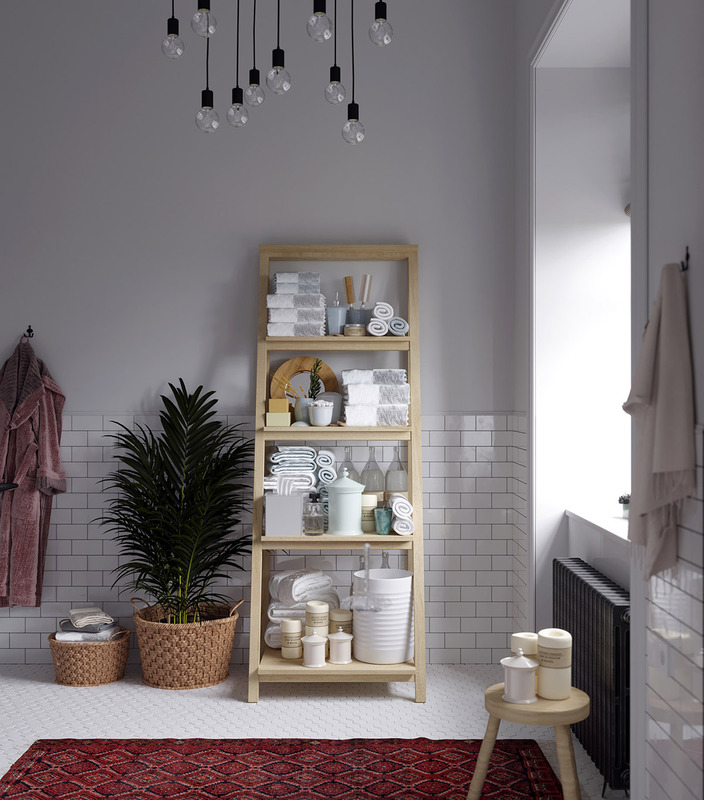 A wooden ladder shelf is overstuffed with towels, toiletries and spare candles. The utility room neighbours the bathroom. 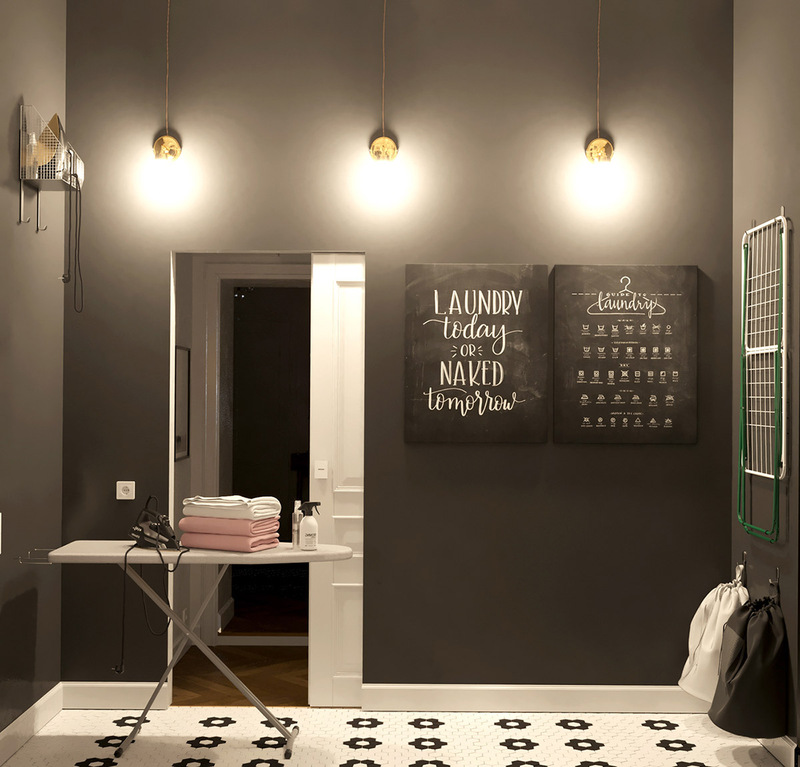 In contrast to the rest of the white apartment, the walls of the laundry room are painted black. 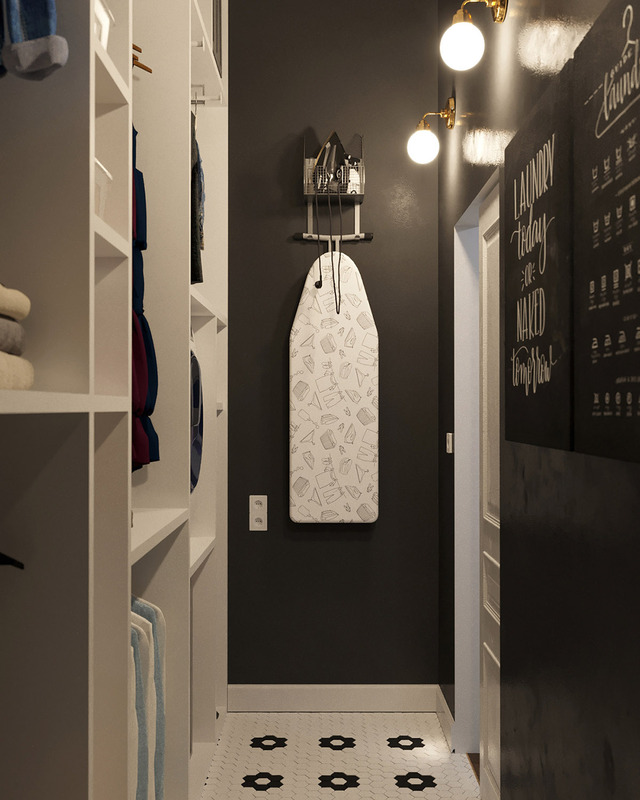 A ironing board bracket transforms one of the small walls into a useful storage spot. Laundry storage bags hang on wall hooks at the opposite end. 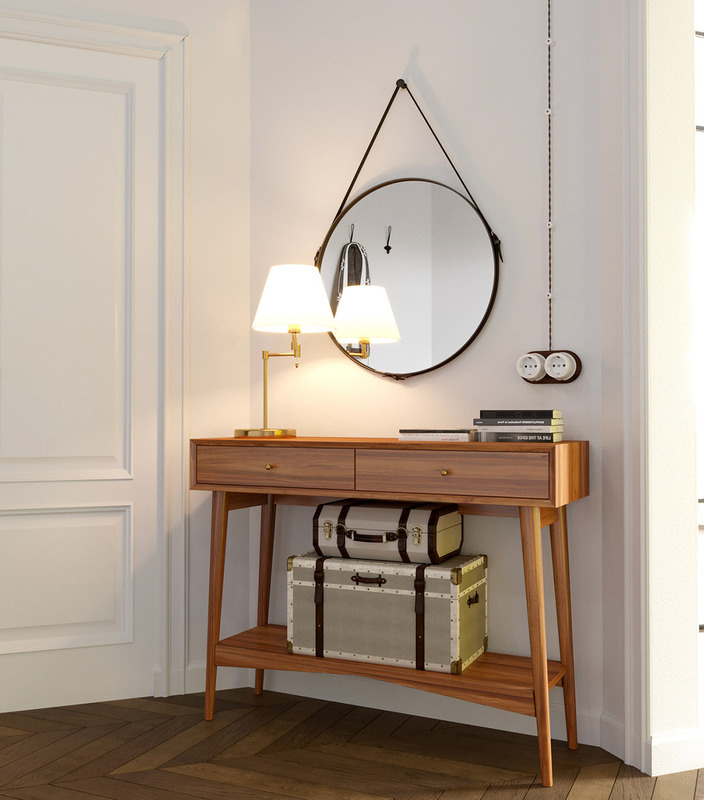 A hall table stands by the entry door, beneath a round mirror hung by a leather strap. 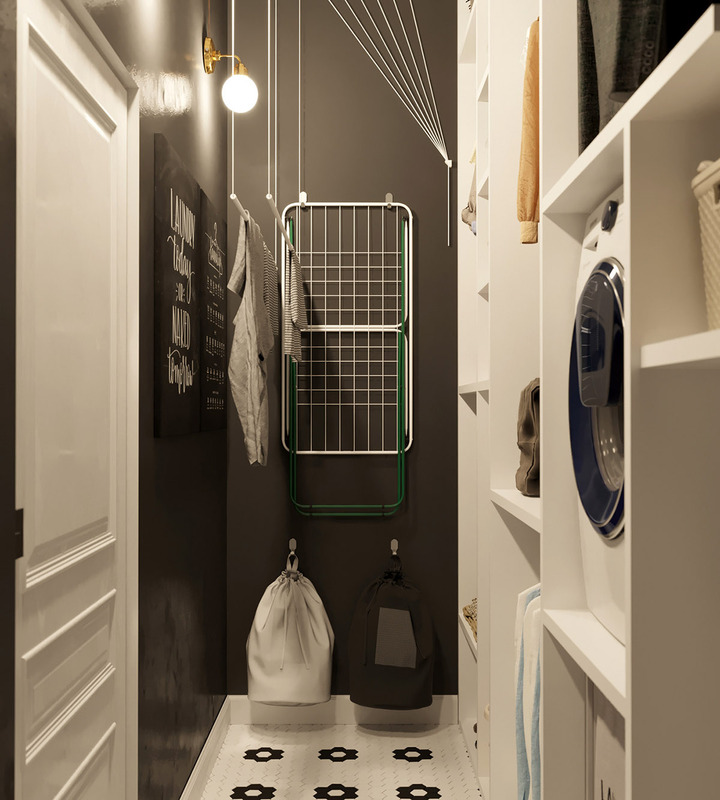 A cupboard has been created up at ceiling height in the hallway that leads to the utility and bathroom. 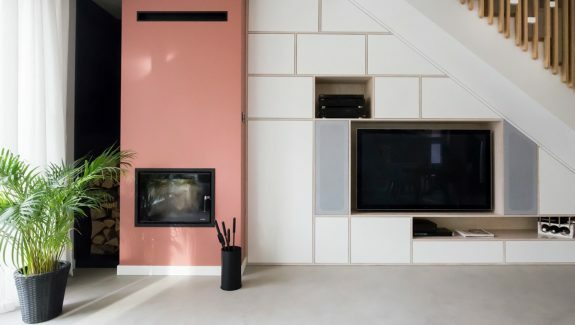 It provides concealed storage behind white sliding doors. Two monochrome prints distract the eye from the storage volume. The pendant lights in the hallway are the same as those in the bathroom. A shoe bench and a set of wall hooks keep the entryway organised.